In the previous post, I talked about the regular procedure for the application for renewal of professional license at the Professional Regulation Commission (PRC). In the regular procedure, the professional license can only be obtained after three weeks or more after you submitted your application to the PRC. What if you need to renew your professional license immediately? The solution for that is the PRC’s express ID or fast ID. The processing of professional license through express ID is just few hours. For those who applied for renewal in the morning, the professional license is released in the afternoon. For those who applied for renewal in the afternoon, the professional license can be obtained in the morning the next day. Step 1: Get the application form (PRC Reg Form 003) from the Information Window, which located near the PRC central office’s entrance gate. The form can also be downloaded from the PRC website (PDF File). Please note that the application form is free of charge. Step 2: Present the duly accomplished form together with requirements at Window 30, which is the priority window for those applying for Express ID. Step 3: Go to “Megadata Office” as instructed by the clerk at Window 30. The Megadata personnel will take your photo, which will be used for your professional license ID. 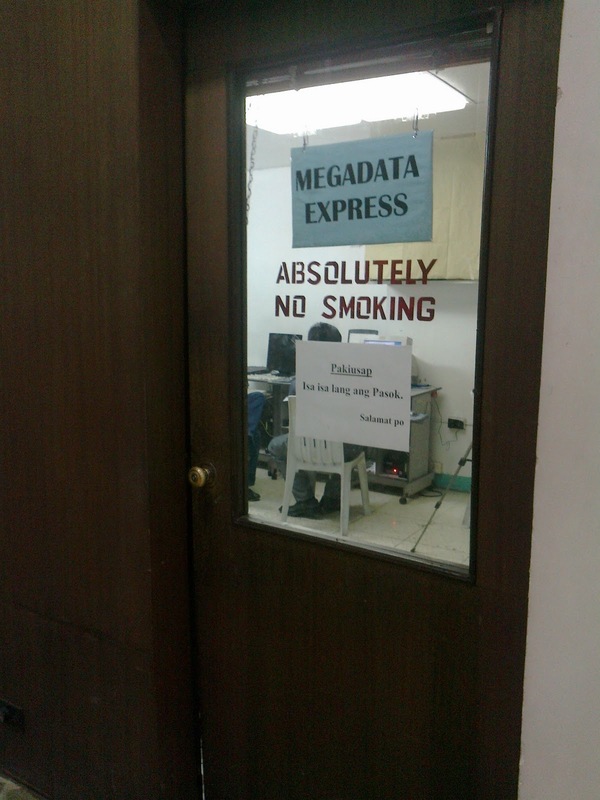 Megadata Office is located near the stairs inside the PRC main building. Step 4: Go to the cashier at Window 36 to pay the fees for license renewal. You will also pay additional fees for the express ID. Step 5: Get your claim slip at Window 30. The claim slip contains the date when you can claim your professional license. Make sure that you will not lose your claim slip. Step 6: Claim you professional license at Window 31. The ID can be claimed in the afternoon, if the application was submitted in the morning. Those who applied in the afternoon can claim their ID in morning of the next day. Do you need more information on the renewal of professional license? Please visit the PRC website or call (02) 736-2248. Read some tips on renewing your professional license at PRC. Thank you for this blog post. Is there a fast id system in the provinces? Thank you for leaving a comment Finn. I am not sure if there is a fast ID system in the provinces. Thanks. Big help to have an idea before going there and being sure you have all the requirements needed. Thanks for your very informative blog. May I just ask about the requirements and processes of applying for renewal of license if I will not be personally filling? I mean, i'll send somebody to do it for me. thanks in advance! You need to issue a Special Power of Attorney or Authorization Letter to your representative. I don't know how the additional fee is. I suggest that you call PRC telephone number: (632) 3140026 and ask them your question. Hi! Is the express id renewal applicable to all professionals? I am a teacher,someone said its only for seafarers. The Express ID can be availed by all professionals. A friend of mine, who is an engineer, availed of this system. She got her ID within the day. The one who gave that information is wrong. Can i do express id if i need to renew my lost prc id? Yes. You can use the Fast ID System of PRC so you can immediately replace your missing PRC ID. Take note that you need to submit an "Affidavit of Loss" for you to get a new ID. The Fast ID and Express ID are one and the same. Yes. You can avail of the Express ID renewal Anonymous. I am working here in Abu Dhabi and my PRC license was expired for more than 1year, just in case is it possible that my parents will process the renewal of my license and used that express renewal ID? and what are the requirements if from overseas? Your parents can renew your license for you. All you need to do is to make an authorization letter for them. trimza: hi, thank you for your information. i am a reg radiologic technologist, and my id expired last april 2012, is this program may allow me to renew my ID? Yes. You can avail of PRC's fast ID system in renewing your professional license. I tried looking for the website of Philippine Association of Radiologic Technologists regarding your query about good standing. Unfortunately, my effort was fruitless. I suggest that you ask PART or PRC to know if they require the certificate of good standing in renewing the professional license. hi is change status and renewal the same? is change status and renewal the same? What do you mean by status Ley? yes change of marital status. I'm married on May 13,2012 and my license will expire on Dec. 27,2013. I'm planning to change marital status. So if the procedure is the same with renewal? Then I will do it at the same time, renewal and change of status. How many days will it take to get the ID if I avail the express ID? The procedures of renewal and change of marital status are not the same but you can do it at the same time when you are renewing your PRC License. You'll get your license in the afternoon if submit your application in the morning. You'll get your license the next morning if you submit your application in the afternoon. I PASSED THE NLE LAST JULY 2011 SO I WENT TO PRC CENTRAL OFFICE TO REGISTER BUT UNFORTUNATELY BECAUSE OF TOO MANY APPLICANTS THAT DAY WE ARE TOLD TO COME AGAIN THE NEXT DAY SO MY FRIEND AND I JUST PAID 1050.00 FOR THE REGISTRATION AND DECIDED TO GO HOME. DO YOU KNOW OR CAN YOU TELL ME WHAT TO DO BECAUSE UNTIL NOW I HAVEN'T GO BACK TO PRC AND I ALSO MARRIED LAST DEC. 2011.. I STILL HAVE MY PRC RECEIPT FROM THE PAYMENT.. PLEASE TELL ME WHAT TO DO.. I WILL WAIT FOR YOUR KIND REPLY THANKS IN ADVANCE.. I suggest that you bring the receipt and all the other documents required for obtaining the license. You should also bring your marriage license. Tell the PRC about your situation. Hopefully, you'll get your license without additional payment. may i ask if Express Id is also available in all prc regional offices? Yes. You can renew your license in advance. You can also avail of the Express ID. As far as I know, Express ID is only available in the PRC Main Office in Manila. Hi~! my teaching license expired for almost a year now. i know that they process renewal in SM Malls but do they all so Express ID there? Thanks! I think that there is no Express ID at the PRC offices inside the malls. It is only available in PRC Manila office. Hi. what can i do if i lost my original claim slip but i have its photocopy? can i claim my prc i'd with that? thanks! Good thing that you have a photocopy of the claim slip. Yes, you can use that to claim your PRC ID. Just explain to them that you lost your claim, just in case that the PRC clerk ask questions. I am glad to have found your generous post, Is there anyone out there who knows if a new board passer can avail this express ID? I already applied for the prc id cards but I need it ASAP so I just can't wait for it to be released. Thank you very much. Yes. You can avail of the Express ID. Hi! Meron po bang cut-off sa time sa pagtanggap ng PRC ng express renewal? Do you know the fees for nurse license renewal? Thank you. Ang cut-off time ng express ID ay hanggang 5 PM. Yung regular fee ng renewal ng license ay 450 pesos. Kung may additional fee man ay baka manggaling na iyon sa Nurse Association. Sila na lang tanungin mo about that. Hi! I just lost my PRC license ID and it was about to expire this end of April this year. Can I still get the fast/express ID right away but the expiration date will be three years from now of the same date as I had? Yes. You can renew your license using the Express ID Anonymous. The expiration will be three years from your birthday this year. HI.My husband told me to renew his prc license. He's already in Al Ain, UAE since Feb 2013. He's License will be expired on November 7, 2013. Is there any chance that I Can apply for the express ID? Pls help me to answer my queries. Thank you! Yes, Darlene. You can apply for express ID for your husband. Please bring an authorization letter from your husband and also the picture that will be used for the PRC ID. Hi is the EXPRESS ID still available by April 1? I'm from the province I just want to renew and claim my PIC the same day. Is this applicable for us nurses? May pasok na po sa PRC sa April 1 so PRC Express ID will be available. If you applied for the PRC ID (through the Express ID) in the morning then you can get your ID in the afternoon. I am not sure if Express ID is applicable for lost PRC ID. Hindi ko rin po alam kung magkano. Pasensya na. Hi is express ID still available now. Express ID is still available. thanks for the info but i have a problem. kainis nag renew kasi ako sa sm ng PRC id ko and that's for one month bago maclaim. late ko na nabasa to.sayang talaga/ may i ask if there's anyway na ma pa fast ID ko un? huhu i need may ID before this month ends. waaa. Grabe naman sa bagal yung PRC na iyan. Yung Fast ID ay available lang sa PRC Central Office sa may Morayta. Kung magpa-fast ID ka ay baka magbayad ka na naman nang bago. Kulitin mo na lang yung PRC na inaplayan mo para i-release nila yung PRC ID mo. You don't need to bring a photo if you'll use express ID. hi good day, tanong ko lang kung pwede ba kunin sa PRC manila ang PIC ko. kasi sa probinsya ako ng file kaso ang tagal halos mag lilimang buwan na nang akoy mag file wala parin eh, eh andito na ako sa manila. I think you can go to PRC-Manila for the renewal of your license. The only problem if the PRC in your province has not forwarded your records to Manila yet. hi. i lost my Prc license a month ago, and i live in the province. can someone (a friend) apply for an ID replacement for me? im planning to have it through Prc Express ID. what are the requirements? 2. Authorization letter or Special Power of Attorney that your friend should bring to PRC. Madodoble yung request mo ng PRC ID kapag nag-apply ka pa uli using express ID. Mas maganda na hintayin mo na lang yung ID na ni-request mo noong May 22.
hi. i would like to ask if pede ako mag renew ng license na expired na for three months at the SM malls? or sa prc lang pede mag renew ng expired license? Yes. You can renew your PRC license at the PRC satellite office in the malls or PRC offices even if the license is expired by three months. Hi can you please help me. I want to renew my license ASAP because I'm going to America but its still valid till next year (2014). Do you think they will allow me to renew it. What are the requirements?how much?yung express sana ang Gagawin ko. Do i need to download the application form that can be found in this site. Thanks. Masyado pang malayo yung renewal date ng PRC ID mo. Hindi ko po sigurado kung OK na magpa-renew ka na agad. I suggest that you call PRC hotline: 310-0026 & 735-4476. Sila ang mas makakasagot ng iyong tanong. I obtain my PRC licence last 2005 and since then i haven't renewed it at least once... Unfortunately, when i decided to renew it, nawala q yung wallet q which contains all my identifications kasama na dun yung expired PRC ID q... Tanung q lng po, do i have to secure Affidavit of Loss for the replacement/renewal of my PRC ID? Mga mgkano po kaya ang penalty q for not renewing my ID on time? Isa sa mga requirements sa PRC ID renewal ay yung photocopy ng iyong expired PRC ID. Kung wala kang photocopy then doon ka na dapat gumawa ng affidavit of loss. Yung penalty po ay depende sa association ng profession ninyo. Minsan kasi nanghahangi ng certificate of good standing yung PRC mula sa association or organization ninyo. Tawagan na lang po ninyo ang PRC tungkol dito. Heto po yung phone numbers ng PRC: 310-0026 & 735-4476.
sa pg aapply po ndg express ID pwede ko po b irenew license ng asawa ko sa express ID kahit wala xa personally? hindi p kekelanganin xa sa megadata photo or un photo na niya lng ibibgay ko dun? Ang normal process po ay magpapa-picture yung tao sa Megadata Room kapag Fast ID. So baka hindi po pwede sa Fast ID ang PRC ID renewal ng asawa ninyo. May dagdag na bayad yata per year na hindi ka nag-renew. Also, depende sa professional organization nýo, baka maningil sila ng dagdag na fee. Hello good pm.may express ID lane po b sa PRC Baguio?. Thanku po. Hi! I'm a nurse living oversea, my PRC license expired last March 2010. Few months from now, it'll be nearly 5 years. Aside from paying the fee + penalty .. is my case considered to get refresher course + other requirements? Or not yet. Thanks. I have no idea regarding refresher course and maybe that only applicable to nurses. I suggest that you ask the nursing association and the PRC regarding this. Pwede po ba mag renew ng expired license (Feb.2015 pa) sa PRC Baguio kahit sa PRC Manila ako registered? Hi! Tanong ko lang po kung pwede po ba ako magrenew ng expired PIC ko (Feb.2015 pa) sa PRC Baguio kahit sa PRC Manila po ako registered?Thanks! Yes. Pwede po. Basta magpa sched kayo online.